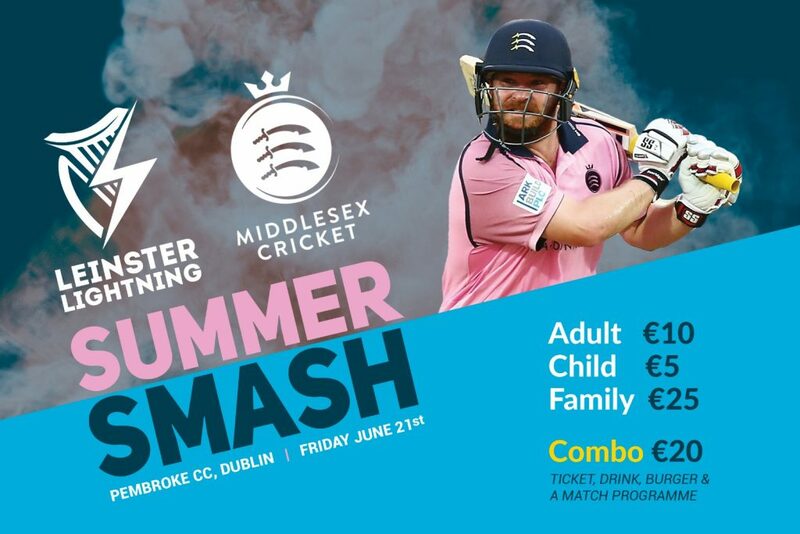 Cricket Leinster is today announcing the ticket pricing and corporate hospitality offering for the Summer Smash Twenty20 Challenge Match between Leinster Lightning and Middlesex to take place in Pembroke Cricket Club, Dublin on Friday the 21st of June. Cricket Leinster is also announcing a Corporate Hospitality offering with marquee and entertainment for the night. The game which will be the first ever match between an Irish province and an English county takes place on the longest day of the year with the Summer Smash starting at 5.30pm on Friday 21st of June 2019. There are special ticket prices for all registered Cricket Leinster Members, who can register for free via the new Cricket Leinster website - www.cricketleinster.ie - and that special price is being offered to Middlesex CCC Members as well. There is also a special ‘Summer Smash’ package that includes admission, a drink of your choice at the bar, a burger from the BBQ and the official Match Programme for just €20 for Members. To avail of these tickets, they must be bought in advance by May 31st, 2019. The Corporate Hospitality offering for the game has been put together to provide a full evening’s entertainment at the height of the summer, the perfect platform to bring your client’s to or network with new ones. There is a luxury summer 3 course meal as well as beer and wine included There is a special post-match Q & A with Angus Fraser, Ed Joyce and one of Middlesex’s international stars before an evening’s live music entertainment. The Challenge Match between the two sides will be the showcase offering of the Cricket Leinster Centenary which is being celebrated with a number of events to mark the 100 years since the organisation was founded as the Leinster Cricket Union in 1919. Tickets can be purchased NOW online here buytickets.at/cricketleinster or by going to the link via the Cricket Leinster website.